"I am really amazed by the rapid reform of Dong Nai Technology University after nearly 2 years returning. I also believe in the prospect of cooperation between our two schools in the future. This time I return to DNTU is to tighten the affection and relationship between the two schools and expect the things we have signed before must be done faster, more". This is the speeching of Mr. James J.Maher - Board Chairman and Rector of University of Niagara (USA) when returning to visit Dong Nai University of Technology in the morning of August 24, 2016. 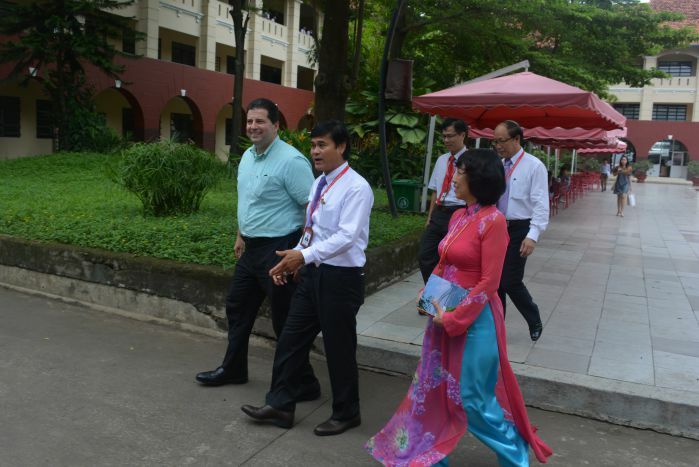 It was a common feeling for all when Mr. James J. Maher and Secretary Ngo Thi Dieu Thuy of Niagara University returned to visit Dong Nai Technology University on the morning of August 24, 2016. The atmosphere of the talk at the Rector's office was so cozy - as in a family, there was no language or geographic distance. There are no written agreements but only a sincere exchange of achievements and prospects of cooperation between the two sides. Mr. James J.Maher cannot hide the feeling of returning to DNTU and see this as part of his school. 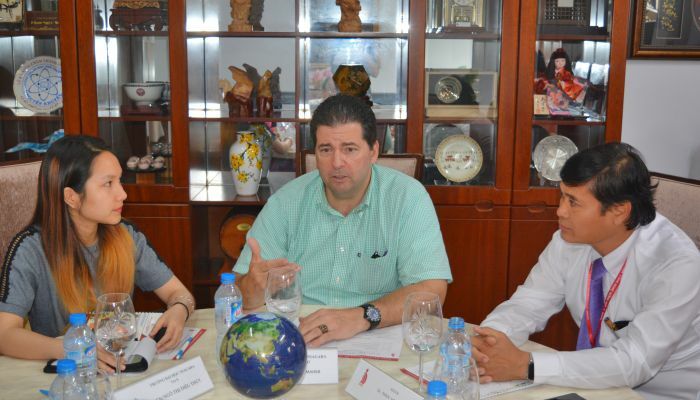 Next and working with Janes J. Maher at the Rector's Office, in addition to Dr. Phan Ngoc Son, there are two Vice Rectors - Dr. Tan Duc Thuan, Dr. Doan Manh Quynh - and Dr. Tran Thi Quynh Le, Dean of the International Relations Department. The co-workers, who have visited and worked with the University of Niagara in the past. The highlight of international cooperation achievements are the advanced and modern constructions of DNTU. From Niagara lessons in building facilities, equipment and welfare facilities to serve the learner, Dr. Phan Ngoc Son has determined to build an integrated center and cultural complex - Modern sports despite facing many difficulties piling up. Not equal to Niagara but investment for facilities is a strategic long-term, sustainable. 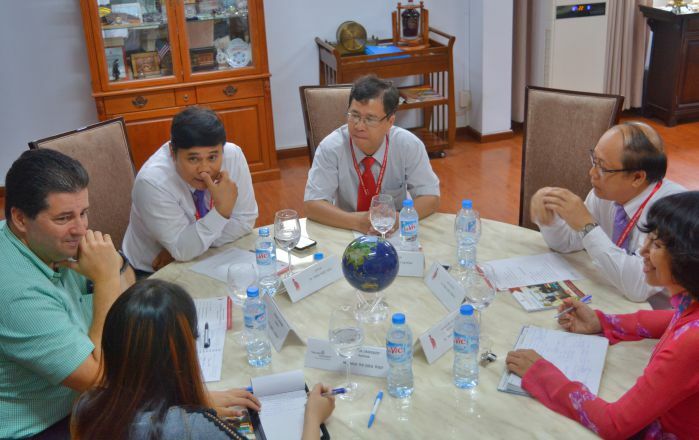 "Only that, we have the conditions to improve the quality and change teaching methods and also expressed the enthusiasm of DNTU is to pursue the goal of building DNTU into a modern university with Regional and international, "Phan Ngoc Son emphasized in the seminar. As the person who charges of teaching and training, Dr. Pham Duc Thuan expressed his determination to study Niagara on a number of issues in content and training methods. On that basis, DNTU has been doing a lot of innovations, demonstrating by the significant reduction of some theoretical lessons to enhance the practice and hone the skills. Promote learning English through the policy of opening Language Centers and increasing the amount of foreign language learning for students from the first year. DNTU committed over 75% of students after graduation have the ability to speak foreign languages in the process of contact with enterprises, find a job. Besides, it is the determination of the whole system to change the teaching method and training the faculty. To have a system like Niagara - DNTU still has to go through many years but now must have the basic foundation. In addition to in-depth knowledge, DNTU requires each lecturer to grasp the advanced methods of education, fluent in at least one foreign language. DNTU has teamed up with Niagara to exchange lecturers. This year, there will be at least 10 lecturers from DNTU to practice in the United States. Firstly, the Deans and Vice Deans of Faculties and in 2017 will be the trainers. Putting students to attend summer camp or study in Niagara in the coming years has been agreed by the two sides. 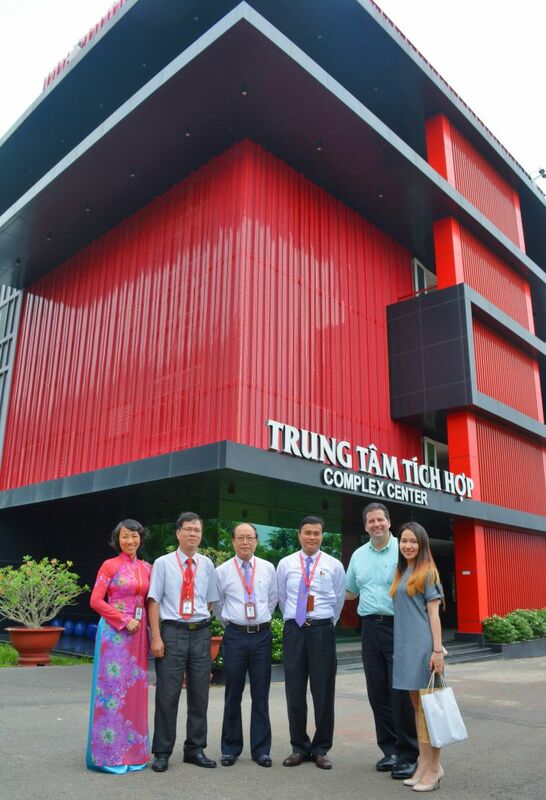 Along with the fun of DNTU before the new school year, Mr. James J.Maher with Dr. Phan Ngoc Son and the teachers in Board of Managers visit DNTU..
At the Integration Center, both sides have taken pictures together with sincere joy for the great development of DNTU. The complex is under construction and will be inaugurated and operational in just one month later. Geographical distance is half way around the world, but surely Niagara will share the joy with DNTU because the two schools were like closed brothers. Cooperation for mutual development - it is the sincere desire of both parties, together, to reach the heights of human personality and knowledge.